If there is one thing Americans are amazing at, it’s multi-tasking. So, it is no surprise that Asia has brought the multi-purpose BB Creams to our doorstep, and they are taking the skincare world by storm! Before you go to purchase a “Beauty Balm” or “Blemish Balm” (they go by so many names! ), we’re give you the lowdown on this new addition to your cosmetic bag. 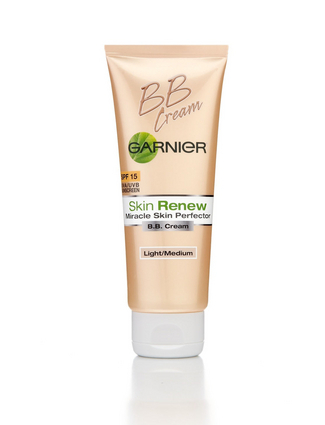 BB Creams are tinted moisturizers with active ingredients as well as SPF. “They are designed for women who are ‘on-the-go’ with little time and want a multi-tasking product that will provide some benefits as well as light coverage (rather than make-up),” says dermatologist Dr. Jeanette Graf. Depending on the BB Cream you use, the product can work as a moisturizer, serum, toner, primer, concealer, foundation, eye cream and/or highlighter. Not only are they time-savers, but they’re money-savers too. Because these creams work as an all-in-one product, “they should be applied to clean skin in the morning,” says Dr. Graf. To apply, blend in the palm of your hand and softly massage product into skin in small circles. To brighten your complexion, start from the cheeks and spread to the outer corners of the face. As BB Creams continue to hit shelves at a rapid pace, we’ve decided to shorten your search by rounding up a few must-have products! This triple function beauty balm improves skin elasticity, brightens and conceals uneven skintone. This cream hydrates and soothes skin, even creating a dewy complexion. The line includes two shades – one for skin with pink undertones and another for golden undertones. Finally a drug store version! Available in two shades – light/medium and medium/deep – this new SPF 15 BB cream has a soft and creamy texture that evens out skin tone, boosts luminosity and hydrates for a full 24 hours.